I am always on the lookout for a portable hammock and I found one on Amazon from Fnova in the color black in blue and it is made with high tenacity breathable parachute nylon taffeta and triple power stitched and holds up to 660 pounds. It is super lightweight, compact and easily portable. This is light enough to favor all kinds of backpacker’s but robust enough for any outdoor and indoor activities. It easily fits in its attached compression stuff sack way and only 1.5 pounds. 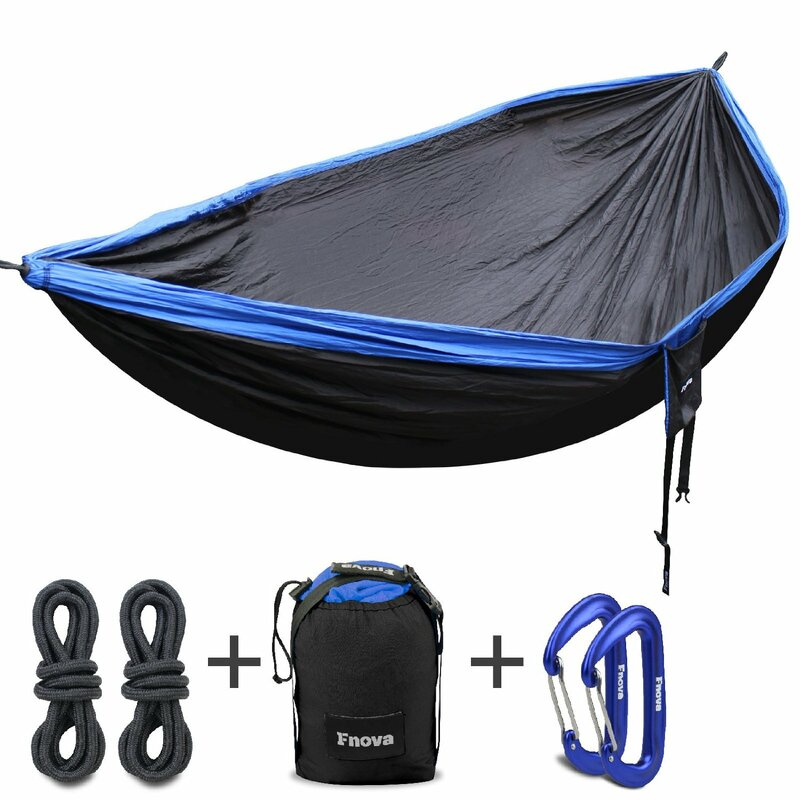 The hammock includes nylon ropes and wire gate carabiners; each Carabiner only weighs 21g, but Major Axis strength is 11.7 KN, it has no sharp edges and will not snag your hammock or straps, you do never worry about tearing your hammock. Why to Choose Our Fnova Camping Hammock: We are Always Stand behind Our Products, and aim to provide high-quality product and world-class service to you, you would never worry about ignoring constantly like other superstar company. My Opinion: I really like the color of the hammock and it was easy to set up and use I like the fact that it’s made of nylon as if anything falls out of the tree such as sap or a bug or leaves fall on it, it’s easy to clean off because of the nylon. It’s easy to put in my backpack it is lightweight and holds my weight when I lay on it.